In Les Parisiennes, Arsène Houssaye wrote “nature is still the best of painters” and we at Musement agree with him. 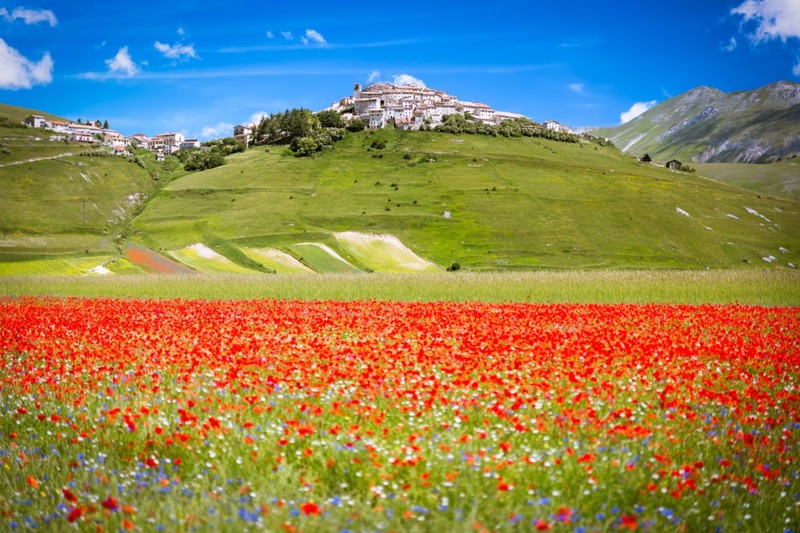 Here is a fine example: the flowering of Castelluccio. That you must see at least once in your life! I first discovered the Marches region about five years ago. After spending four months in a London winter working as an au pair with the least communicative family in the world and a four-year-old boy who was obsessed with death, to say the least, I needed some human warmth and sunshine. 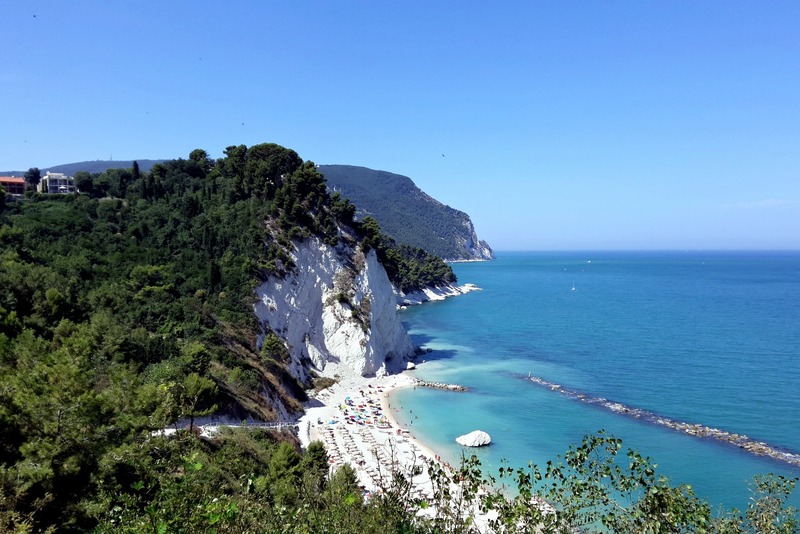 So I decided to spend a summer in Marche, central Italy, on the Adriatic coast, and I discovered a lost paradise, full of history and legends, inhabited by an authentic people whose culture and mores stem directly from the power of local landscapes. I’ve never seen such diverse landscapes and flower variety in such a small area. In an instant you can move from large stretches of fine sand bordering a turquoise sea mounted by clay cliffs covered in spots of all kinds of plants, to a rocky mountainous desert accessible by crossing a lush green countryside. And the gastronomy, of course, changes and adapts according to the environment (but that’s a story for another time). The flowering of Castelluccio perfectly illustrates this rich diversity. Located in the heart of the Sibillini Mountains, on the border between Umbria and Marche, these limestone valleys (a desert and almost lunar landscape throughout much of the year) suddenly turn into perfectly geometric fields, covered with flowers of all kinds and colors, from late May to mid-July. There’s something mystical about this wonderful spectacle that nature offers us every year. And though I swear I’ll keep it secret every time I have a chance to see it, I now want to promote this earthquake-ravaged area, in hopes that it will be gradually rebuilt by tourism, which, in certain cases, can be a valid solution to boost regional economies. My visit to the Castelluccio plateau has become a sort of ritual; I have my little habits that I am very fond of. My day would always begins with a nice breakfast at a bar: brioche and “caffè macchiato al vetro” (served in a long glass cup to ensure more foam). Equipped with a large straw hat (made by craftsmen in the medieval village of Montappone, Fermo province) and armed with gourds, I hit the road, always in good company, with one arm outside the car window, singing Italian songs looping on the radio. Just like that, because it’s summer! First of all, you must understand that time in Marche runs much slower. Don’t be in a hurry – as a Frenchwoman brought up in urban areas, it took me years to get used to this slower pace. There’s only one solution: take your time, no need to hurry. In any case, there’s nothing urgent to do and there are no traffic jams in the region. After an hour’s drive you can stop to visit Visso, where you simply have to taste the delicacies of the finest bakery and pastry shop in town-Pasticceria Vissana (even crackers are delicious here: golden and irresistibly fragrant, you don’t even need to spread anything on them in the morning). You should then head to a tiny family grocery shop called Cappa Di Cappa Antonio & C, which has been managed by family members for generations. Even the wooden curtains are wonderfully tacky. They sell excellent regional cheeses and delicatessen and also their own cookies and cakes including a delicious “Crostata alla ricotta“. I had my first slice of this delicious cake here, and I would travel all the way from Milan just to have another one. It’s a sweet tart, stuffed with ricotta and chocolate chips; the freshness of the cheese sparks the imagination, inspiring pictures of a shepherd bringing it down from the hill in the morning, it will delight your taste buds for the whole day. Don’t forget to order a few sandwiches for a quick lunch. Pick your favorite bread (which is made here over a wood fire), garnish it with you favorite toppings, and you’ll have a divine quality snack for a really low price. Take the opportunity to try your first “caiuscolo,” a sausage spread on a slice of country bread, bruschette or crostini. Soft, almost creamy, and cooked in wine and garlic, it is produced only in Marche and Umbria, and it has an IGP certificate. Quench your thirst in the small fountain next to the shop and fill your water bottles with it, as it comes straight from the pure springs of the Sibillini Mountains. If you prefer mineral water, make a responsible gesture and buy Nerea water (produced in Castelsantangelo sul Nera, the epicenter of one of the most devastating earthquakes in the past 35 years, and recently reoccupied by water companies). After this first stretch and while carrying a lot of water, take the road to Ussita, one of my favorite villages, which was completely destroyed by the 2016 earthquake. A ghost town, that no longer exists because it has yet been rebuilt. For me it was a necessary stop on the road to see the flowering of Castelluccio. These is where I would stop for a riverside picnic and have the sandwiches that I had brought from the grocery store I mentioned before (after resisting the temptation to eat them along the way). A young boy once asked me to meet him here for a romantic date, hot chocolate and ice-skating included! The economy of all of these villages in the Umbria-Marche region and the Sibillini Mountains were predominantly based on tourism: skiing, hiking, mountain biking and many other activities that need to be revived in order to bring these villages and their inhabitants back from their current lifeless state. 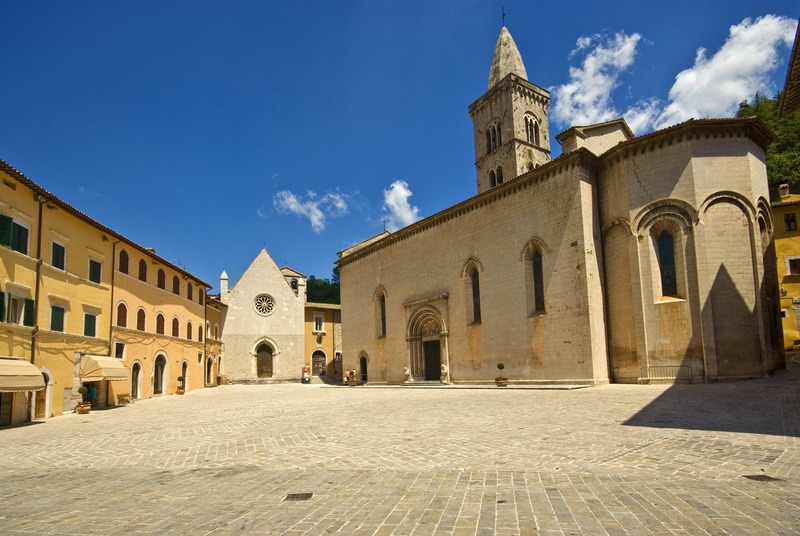 But local economy is also based on the production of cheese and sausages, and on the harvesting of truffles, vegetables and cereals – among which the exists the famous “Lenticchie di Castelluccio.” These activities are slowly recovering their vigor, and you can support them by purchasing these products, either here or there. But now is not the time to think about that: you must conclude your journey and finally reach the Castelluccio plateau, where nature offers a stunning and indescribably colorful show. Admire the geometric fields that stretch for miles and miles over these rounded, sensual and motherly valleys. An explosion of flowers that differ every year, and even every day, they are completely unpredictable with intense colors that transform the landscape. This year, come see the “Fiortura di Castelluccio,” a symbol of hope and rebirth, to support farmers, peasants and residents in the affected areas. And to remember that even though it can be destructive, Mother Nature has a lot to offer – inspiring, in an unstoppable cycle of rebirth, planting the seeds of hope for the future and in the deep beauty of things and men.